Expires 11/30/14. You will instantly receive a unique code that allows you to redeem your order online at papajohns.com from the Victoria location. One deal per person please. When ordering at papajohns.com, be sure to log-in and select the Victoria location before using your unique code. 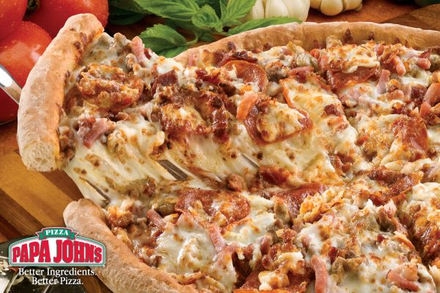 This deal is for Any Large Specialty pizza from Papa John’s Pizza when you order online from the Victoria location. This can be used for any large specialty pizza including The Works, The Meats, Garden Fresh, Spinach Alfredo, Hawaiian BBQ Chicken, and many others to choose from. Papa John’s is known for Better Ingredients – Better Pizza because at Papa John’s they use only fresh cut vegetables, all-natural tomato sauce made from tomatoes picked during the three-month season when they’re most ripe and packed within an average of six short hours, 100% mozzarella, meats that are 100% real – never any fillers, and dough made from high-protein flour and clear-filtered water.